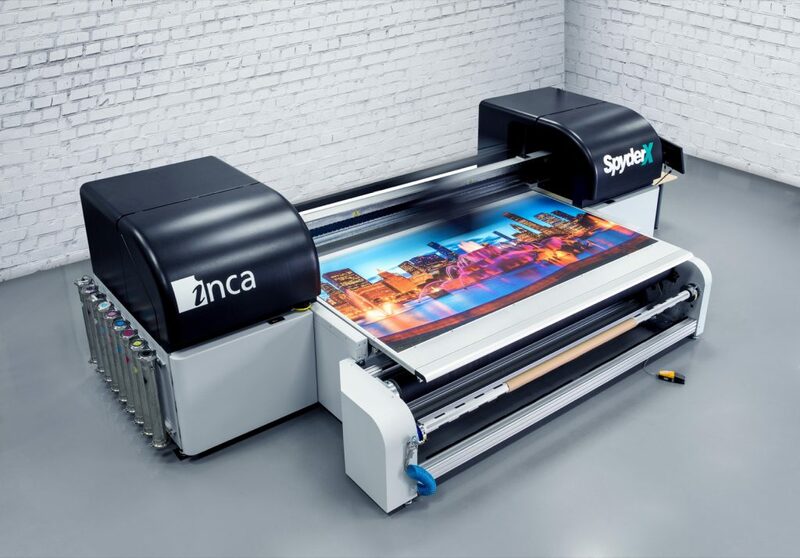 The robust 126″ (3.2 m) wide, 6 color + white SpyderX by Fujifilm and Inca is available as either a flatbed, or a combination flatbed/roll to roll model for handling rigid and flexible substrates. This powerful and versatile printer is capable of producing a wide variety of products. 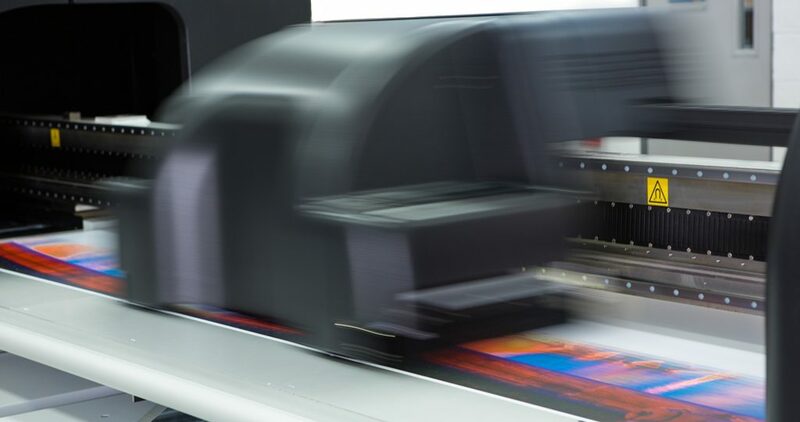 Using Fujifilm Uvijet XS ink, the printer delivers high speed (2,476 square feet per hour or 230 square meters per hour) production with sharp, pinpoint accuracy while handling a wide range of media and applications. The SpyderX builds on the heritage of Inca’s successful Spyder 320 range, the high-performance Onset platform and the innovative OnsetX Series launched in 2015. Today nearly 1000 Inca printers – all designed and manufactured at Inca’s headquarters in Cambridge, UK – are in operation globally producing graphics from high profile backlit work with impeccable quality to Point of Purchase work for national retailers to fast turnaround banners. SpyderX allows for both rigid and flexible printing resulting in a wide variety of applications from menu boards to banners to backlit signs and permanent indoor displays. And with SpyderX including light inks in the standard channel configuration, it allows for finished prints with smooth tones and gradients while still printing at remarkable speeds. The SpyderX standard configuration also includes two white ink channels. The addition of white ink allows for printing on clear and dark substrates, as well as layered printing over or under an image, or it can be used as a spot color. The 126″ (3.2 m) wide roll-to-roll system turns the flatbed machine into one of the industry’s most versatile production-class printers, allowing it to produce high-quality UV print on both sheetfed and roll-fed substrates. The roll to roll system can be purchased at the time of machine install or it can be added to an installed machine should business needs change. With a robust motion control system and changeover time as short as walking around the machine, the addition of the roll to roll system converts the SpyderX flatbed machine into a truly versatile hybrid printer. Several proven and new, innovative technologies come together from Inca and Fujifilm with SpyderX speed and flexibility. The printer is equipped with several intelligent features for consistent quality and productivity. The automated cleaning station and onboard maintenance scheduler help to maintain the printheads without manual operator intervention, avoiding compromising on throughput and quality. A mist extraction system further reduces nozzle clogging while the onboard nozzle mapping technology allows the machine to cope with deviated or missing nozzles without slowing down production or a loss in quality. The unique technology of Print-a-Shim ensures that table flatness is consistent. 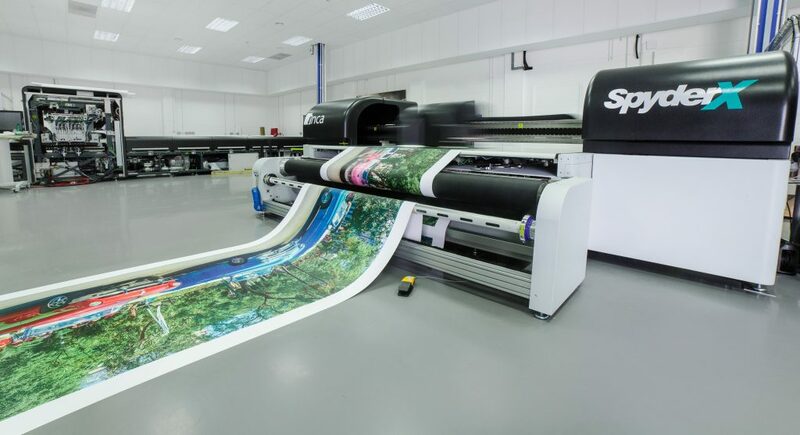 The SpyderX platform incorporates state-of-the-art, patented technology in which the vacuum table is optically mapped and adjusted to give optimum print quality across the full area of the bed. Whatever the application, whether it is photographic imagery, or nesting a fine text file across the printable area, the SpyderX delivers. The operator-controlled UV system of the SpyderX allows even the most delicate and challenging materials to be printed. The ability to alter the level of UV improves the adhesion to the most difficult substrates while still providing the flexibility required for finishing. The 6-zone vacuum table reduces bed masking requirements for substrates thinner than 3 mm which in turn shortens setup times, increasing overall machine productivity. The 126″ x 63″ (3.2 m x 1.6 m) table is equipped with eight registration pins that enable the efficient and accurate positioning of media when printing double-sided work on the flatbed. Inca’s patented nozzle-mapping feature minimizes print quality issues caused by deviated, unstable or blocked nozzles. To identify defective nozzles, the operator prints a test pattern and then identifies and inputs the defective nozzles into the user interface. The machine then prevents jetting from affected nozzles and compensates with adjacent functional nozzles. The procedure takes on average less than five minutes. This ensures continuous operation with no loss of either productivity or image quality. SpyderX is designed for consistent quality and productivity to ensure that jobs can be delivered on time with exceptional quality for customer satisfaction. SpyderX utilizes Fujifilm Dimatix Q-Class printheads. Q-Class printheads are reliable, trusted and are used in several inkjet platforms. Q-Class printheads from Fujifilm Dimatix jet straight and fast for accurate dot placement. The SpyderX has 8 printheads per channel with a total of 64 printheads. The Uvijet XS ink system was developed by Fujifilm for the the SpyderX platform. Uvijet XS ink provides excellent adhesion to a broad range of substrates, including both rigid and flexible substrates.